The Royal day had arrived and I was up early to take advantage of the great day. My mate John was supposed to be at my place at 6.30am, he was early at 6.20am which gave us a head start to drive up to the lake. Six of us were having a wedding breakfast for the Royal couple, well not exactly but we were going to have 3 pans on the go at once. Eggs, bacon and sausages. John and I arrived at the lake at 6.50am to find Reg and his lad Sam already fishing. They had been there since 6.30 and hadn’t yet caught. The swim I fancied was free and it was a good place to cook up. 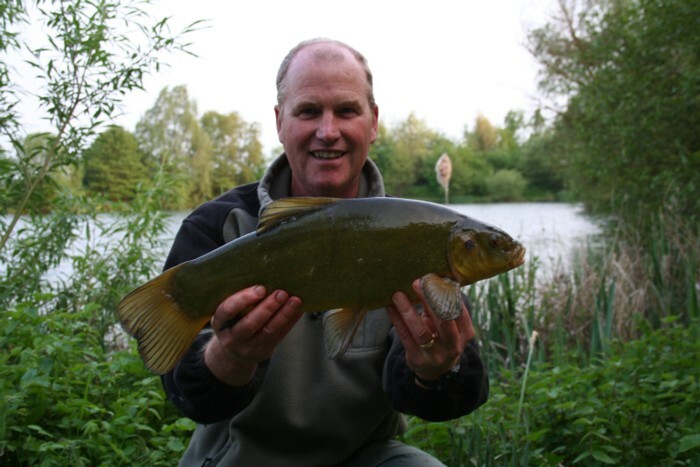 John was a guest of mine so was Dave Rogerson who is the RO of the Tench Fishers. Once we had all sorted out the tackle and cast out it was time for a brew. One of our 6 was going to be late in arriving so we had to wait until later for the breakfast. It would have been great to say that the action was fast and furious but it wasn’t. By 9.45am the party was complete and we started to cook the breakfast. One of the owners and the game keeper came for a butty, as did one or two other anglers on the lake. Once the breakfast was eaten everyone returned to their swims. By now there were 20 anglers fishing the lake, I’ve never seen so many people angling. Time went by and I promised Dave Rogerson some action, eventually he had some. I was chatting away up the bank and my rod roared off and he struck and found the reel handle missing. I obviously wasn’t there to see the incident but it must have been very funny. He is left handed so it took him a while to realise his problem. Soon though he had the situation under control and we netted a little fish of a few pounds. Things didn’t improve as the day wore on, in truth everyone of the 20 anglers was moaning about the sport. 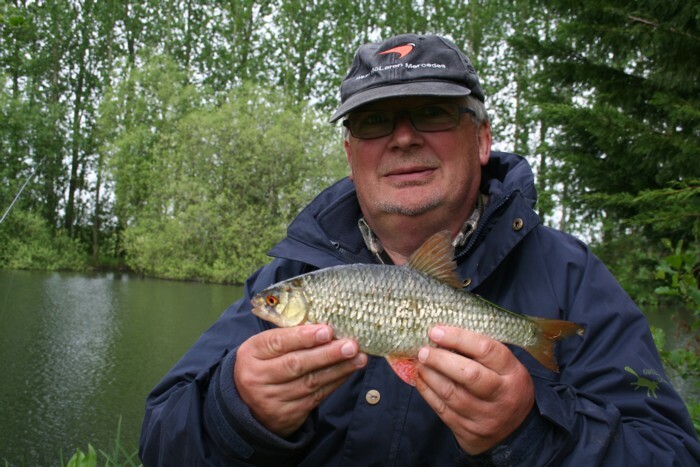 John was catching a few small roach and rudd from a smaller lake just behind out swim. Soon the day was drifting away as were the anglers. Dave needed to leave and we said our goodbyes. I had one tench of about 4lbs ish. John took a quick photo just to show that the fish were feeding. Dave will never believe me! 20 anglers and less than 10 tench caught is unbelievable. Near the twilight it was only Reg, Sam and me left. I moved to make the journey home wondering what was going on. Normally you catch a dozen tench each visit. Tomorrow I’m taking Dave there to catch him some tench. I’m worried. Oh dear!! This entry was posted on Sunday, May 1st, 2011 at 5:57 pm	and is filed under Uncategorized. You can follow any responses to this entry through the RSS 2.0 feed. Both comments and pings are currently closed.